On Wednesday, August 1, 2018, 50 Park acquired ChartYourTrade.com. Going forward, all our work will be published on ChartYourTrade.com. To continue receiving our free reports sign up to the free newsletter on ChartYourTrade.com. Stocks ended a busy week mixed as investors digested a slew of economic and earnings data. The big sell-off of the week came from Facebook, Intel and Twitter but Facebook was the biggest. Facebook gapped down after reporting earnings. That followed Netflix’s big gap down a week earlier. On a bullish note, both Alphabet (Google) and Amazon both gapped up after reporting earnings. There were several other big cap stocks that reported earnings this week and so far, the reaction is lackluster at best. We have seen strong numbers, but we have not seen a strong reaction to the numbers. Our long-standing clients know we care more about the reaction than the actual data because the reaction tells us what investors are doing, not what they are saying or thinking. We care about action. Stocks edged higher on Monday as investors waited for a slew of earnings to be announced this week. Alphabet (a.k.a Google), reported earnings after the close and the stock was higher after reporting strong numbers. As of this writing, nearly 20% of S&P 500 companies have reported earnings for Q2, with 82% of those companies topping estimates. FactSet data shows us that Wall Street expects Q2 earnings growth of 20%. Stocks opened higher but sold off on Tuesday after the latest round of earnings were released: GOOGL, VZ, and MMM just to name a few. In other news, the government said it will give farmers money to help offset the tariffs. On Wednesday, stocks rallied as investors waited for Facebook and a slew of other stocks to report earnings after the bell. The big news after the bell came from Facebook when shares plunged over 20% after the company warned that sales may slow due to decelerating user growth. Stocks ended mixed on Thursday as tech stocks lagged while the Dow rallied. Facebook gapped down and lost over $100B in market cap in a single day. That was the largest decline in history for market cap in a single day. The big sell-off dragged several other tech and social media stocks lower. After the close, Amazon gapped up after reporting earnings. Stocks fell on Friday, dragged lower by the tech sector, after Intel and Twitter both fell hard after reporting earnings. Before Friday’s open, second-quarter GDP rose by +4.1% which was the best reading in nearly four years. Do You Know The Cheapest Stocks On Wall Street? 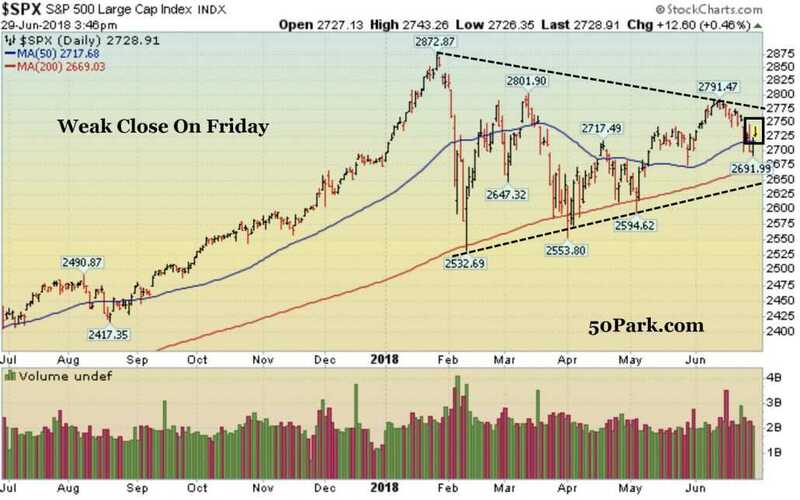 Stocks ended mixed to mostly higher last week as the Russell 2000, Dow Jones Industrial Average and the benchmark S&P 500 ended flat to slightly higher while the tech-heavy Nasdaq composite fell. Earnings continued to be released in droves as several high profile stocks announced earnings last week. Netflix kicked off the week, by gaping down after reporting earnings. That put pressure on other tech stocks and the broader Nasdaq composite. Microsoft ended the week on a positive note when it gapped up on earnings. Several other well-known companies reported mostly mixed to slightly stronger than expected earnings. The other big headline last week came on Friday when President Trump said he is open to announcing tariffs on just about all of China’s goods. Technically, the major indices are pulling back after a strong two week rally. Stocks were relatively quiet on Monday as investors waited for a slew of earnings to be released. Before the open, Bank of America reported earnings and the company saw earnings grow 33%. After the close, Netflix gapped down after reporting earnings but rebounded on Tuesday and closed in the upper half of its daily range. Stocks ended higher on Tuesday as Amazon surged on the overwhelming success of Amazon Prime Day. Stocks rallied on Wednesday after Morgan Stanley announced solid numbers. Separately, Transports rallied after CSX and United Continental posted stronger-than-expected profits and sales. Stocks fell on Thursday as investors digested the latest round of earnings data. President Trump said he is “not thrilled” about the Fed raising interest rates which was the first time he publicly commented on the Federal Reserve since Jay Powell became Chairman. Separately, Comcast dropped its bid for Fox and will instead focus on Sky networks for its European assets. Stocks ended modestly lower on Friday after President Trump said he would consider placing tariffs on just about all goods made in China. 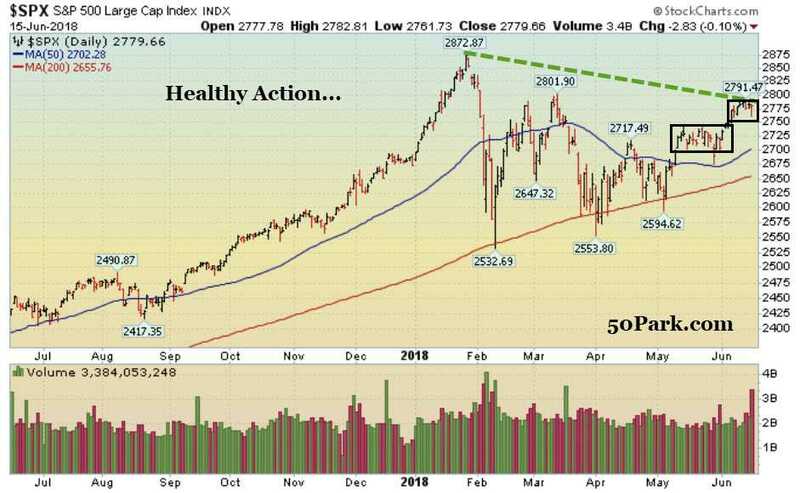 Stocks ended mixed to mostly higher last week as the Dow Jones Industrial Average, the benchmark S&P 500 and the tech-heavy Nasdaq composite rallied, while the small-cap Russell 2000 fell. Earnings season officially began last week with a few high-profile companies reporting decent numbers. Pepsi Co, JP Morgan Chase, Citigroup, and Wells Fargo were some of the companies that reported earnings last week. The key now is to analyze how the market and individual stocks react to the numbers. I pay a lot more attention to how the market and each stock reacts to the data, because that tells me everything I need to know. Remember, we are not privy to what the large institutions are doing on a day to day basis but collectively they can’t hide and when they move, it shows up in both price and volume. Stocks rallied nicely on Monday and enjoyed the best day since March. Big institutional money flowed into the financial sector ahead of earnings later this week. Several big banks are slated to report earnings later this week and, so far, expectations are for a strong results. Stocks opened higher nicely on Tuesday before afternoon weakness showed up in the Russell 2000 and the Nasdaq Composite. Intra-day, the Russell 2000 hit a fresh record high and continues to lead the other popular averages. Before Tuesday’s open, PepsiCo reported earnings and was one of the first major companies to report earnings. So far, analysts believe Q2 earnings will grow close to 20% on a year-over-year basis. That was very close to Q1 2018’s reading of 24% on a year-over-year basis. After Tuesday’s close, stock futures fell triple digits after the White House announced $200 billion in new tariffs on Chinese goods. Stocks fell triple digits on Wednesday as the world digested the new round of tariffs. The sell-off did not last long as buyers showed up on Thursday. Stocks rallied nicely on Thursday as the tech-heavy Nasdaq composite surged to a fresh record high. Shares of several tech giants rallied and that lifted the market higher. Stepping back, the fact that the market continues to rally as we head into earnings season is a net positive for stocks. Stocks were relatively quiet on Friday as the market digested the latest round of earnings and the week’s action. Stocks opened the third quarter with a bang as the bulls regained control of the market. For the past few weeks, the market has given us a few head fakes but has failed to move higher in a concerted fashion. During that time, the market has been flirting with important support (highlighted in prior reports). Now that support has been successfully tested and defended, odds favor, the market rallies from here. Stocks opened lower but closed higher on Monday which was the first trading day for the third quarter. Over the weekend, Canada announced historic tariffs that matched (dollar for dollar) tariffs announced by Trump against Canada. This sparked concern that the trade war may escalate with other countries. Thankfully, the bulls showed up and defended critical support for the market. The S&P 500, Nasdaq, Nasdaq 100, and small-cap Russell 2000 all bounced after testing their respective 50 DMA lines. In the short term, that is a healthy sign. On Tuesday, stocks were relatively quiet as the market closed early for July 4th. Stocks were closed on Wednesday in observance of the July 4th holiday. Stocks rallied nicely on Thursday after the bulls defended major support. In its last meeting, the U.S. Federal Reserve said it was worried the economy is getting too strong and that could lead to a “significant economic downturn.” To combat inflation and the strong economy, the Fed said it wants to raise two more times in 2018. Stocks rallied nicely on Friday and ended the first week of the third quarter with solid gains. Friday was the last trading day for the month and quarter. After the dust settled the market ended mixed for the month and slightly higher for the quarter. The big theme for Q2 was a bifurcated market whereby we saw strength in the Small Cap Russell 2000 and the tech-heavy Nasdaq 100 and relative weakness in the Dow Jones Industrial Average and the benchmark S&P 500. The overarching concern for most of the quarter was the ongoing dialogue with respect to global trade from the White House. The White House wants to even the playing field and is not afraid to take decisive action to do so. Meanwhile, global economic partners want to preserve the status quo and threatened retaliation. So far, it has been a lot of rhetoric and not a lot of action. That is a net positive for stocks. Technically, the major indices are doing their best to defend major support. As long as support holds, higher prices will likely follow. Conversely, if support breaks, I have to expect the market to retest February’s low. Stocks fell hard on Monday after The Wall Street Journal reported Sunday night that President Trump wants to limit Chinese investments in US Tech companies. The move caught people off guard but during the day on Monday Steven Munchin, Secretary of Treasury, tweeted that the news is fake. Munchin said, “On behalf of @realDonaldTrump, the stories on investment restrictions in Bloomberg & WSJ are false, fake news. The leaker either doesn’t exist or know the subject very well. Statement will be out not specific to China, but to all countries that are trying to steal our technology.” The market didn’t care and the damage was pretty severe. On Tuesday, stocks bounced back a little but closed in the middle of the daily range (not the best sign). The Dow was up about 285 points on Wednesday after the White House said it will use existing laws to curb Chinese Investments in US tech stocks and not go after alternate options. That was received well intra-day but sellers showed up by the closed, erased the big gains for the day and closed in the red. 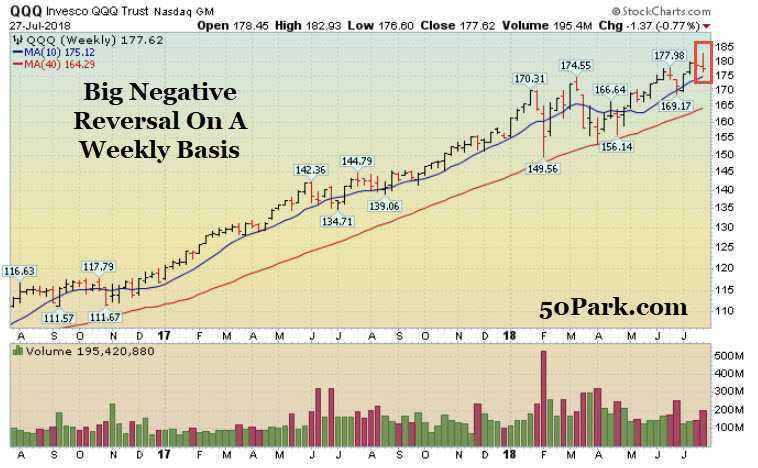 That big negative reversal was not a good sign. Stocks opened lower but closed higher on Thursday after the bulls showed up and defended major support for the market. The Dow is flirting with its longer-term 200 DMA line and the S&P 500 and the Nasdaq are flirting with their 50 DMA lines. The market is still a little weak and needs a good boost to shake off this recent bout of weakness. Stocks were relatively quiet on Friday which was the last full trading day for the month and quarter. The major indices ended mostly lower last week amid the ongoing trade woes. In the first half of the week, President Trump said he will consider adding tariffs on nearly $200 billion worth of Chinese goods. A few days later, China responded by saying, the US has “delusions” regarding the trade war. It is important to put the on going trade dispute between the two economic powerhouses in the proper context. Here are some facts: The US economy is roughly $19T and currently, China only imports $130B of goods from the US. Meanwhile, the US imports $505B from China. That’s why the administration is doing what it is doing. From my point of view, the only thing that matters is what does all this mean for capital markets? Stepping back, this is mostly noise until we see definitive action. Recently, the Dow has been lagging because it is the most sensitive to the ongoing trade woes. So far, the market – and leading stocks- continue acting well and that tells me everything I want to know. In the short-term the major indices are extended and are pulling back. They key now is to analyze the health of this pullback then go from there. Keep in mind we are approaching the end of the month and the end of the quarter which usually has a slightly upward bias. Stocks ended mixed on Monday as the Dow and S&P 500 fell but the Nasdaq managed a small gain. The market opened lower after concern grew regarding a potential global trade war. After the close, President Trump said he is prepared to announce tariffs on $200B worth of Chinese goods. Overnight, global equity markets plunged and stocks opened lower on Tuesday. 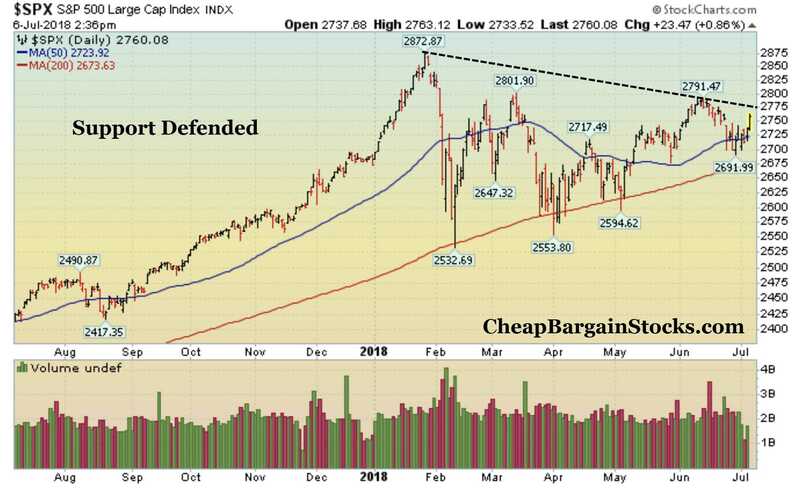 Once again, by the close, the market ended in the middle to upper half of its range which is a somewhat bullish sign. Wednesday was a relatively quiet session. Stocks opened higher on Wednesday but the Dow quickly gave back its gains and turned lower. Separately, Disney raised its bid for Twenty-First Century Fox assets to $38 per share, or $71.3 billion. That was higher than Comcast’s offer of $65 billion in cash for the Fox assets which include FX, Star TV and stakes in Sky. e-commerce stocks fell on Thursday, after the U.S. Supreme Court allowed states to collect taxes from retailers that do not have a physical presence there. That is a big game changer for the entire e-commerce industry. Stocks were quiet on Friday with the only big headline coming from OPEC. OPEC decided to raise production slightly to help with the oil market. The split tape I mentioned over the last few weeks continues as the Nasdaq and Small-Cap Russell 2000 hit fresh record highs while the S&P 500 and Dow Jones Industrial Average lag. The reason is simple: there remains a lot of uncertainty with respect to how this ongoing “trade war” that is brewing may unfold. The Dow and S&P 500 are more sensitive to these headlines while the Nasdaq and the R2k are less sensitive. Elsewhere, it was a big week for global central banks as they are all (slowly) moving away from the ultra-easy money era since the 2008 financial crisis. To be clear, they are still adopting an easy money stance, but the ultra-easy money period is now behind us (at least until the next recession or bear market). Stocks ended slightly higher on Monday after the G-7 meeting ended and Trump headed to Singapore for the N. Korea Summit. Overnight, Trump and Kim signed a historic deal and the market barely moved. On Tuesday stocks were quiet as the world waited for a busy week from global Central Banks. Separately, Tesla said it will slash 9% of its workforce and Elon Musk acknowledged that the company will have to turn a profit “some day.” Stocks fell on Wednesday after the Federal Reserve raised rates and signaled two more rate hikes may happen later this year. Stocks ended mixed on Thursday after the ECB slowly moved away from its ultra-easy money stance and President Trump signaled he may slap tariffs on China. By Friday’s open, $50 billion of tariffs were announced and now the world is waiting for China to respond. That concern largely dragged the market lower on Friday. 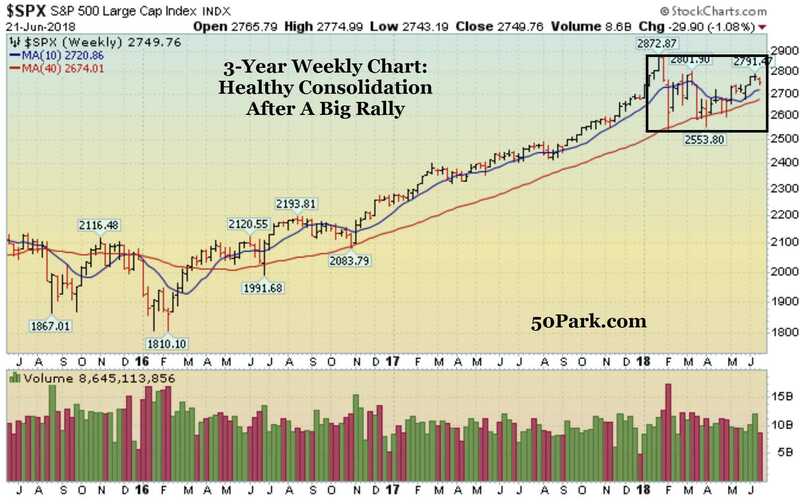 The Nasdaq hit a fresh record high and officially ended its four month “correction.” That came shortly after the small-cap Russell 2000 ended its correction and hit fresh record highs. Clearly, those are the two areas of strength as they were the first indices to breakout and hit fresh record highs. 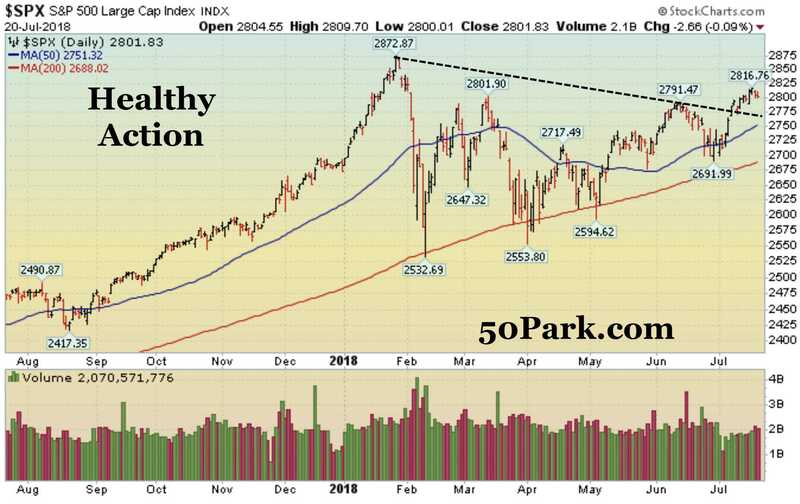 Separately, the Dow Industrials and the S&P 500 are still trading below their 52-week highs but appear to be on track to hit new highs soon. Right now, we are seeing a classic case of a great mini-rotation -where the leading indices pause to digest the recent/strong rally while the weaker ones play catch-up. It is important to keep in mind that the leading indices are extended right now and way overdue to pullback. I would like to see a nice quiet light volume pullback over the next few weeks but the market doesn’t do what I want it to. Separately, the end of the month and quarter are around the corner and they usually have a slight upward bias. Stocks rallied nicely on Monday after a few large tech stocks hit fresh record highs. Shares of Apple, Netflix, Amazon, Nvidia, and Microsoft, all hit new highs which helped lift the tech-heavy Nasdaq higher and the broader indices as well. In other news, earnings season has largely died down and, on average, Q1 earnings largely beat estimates by a very nice margin. Stocks were relatively quiet on Tuesday as the Nasdaq hit a fresh record high and trade concerns weighed on the broader market, specifically financials. China said that it will buy close to $70B of goods from the US if the tariffs are not imposed. Elsewhere, rumor spread that the White House is open to the idea of creating a new trade deal with Mexico and Canada to get out of NAFTA. 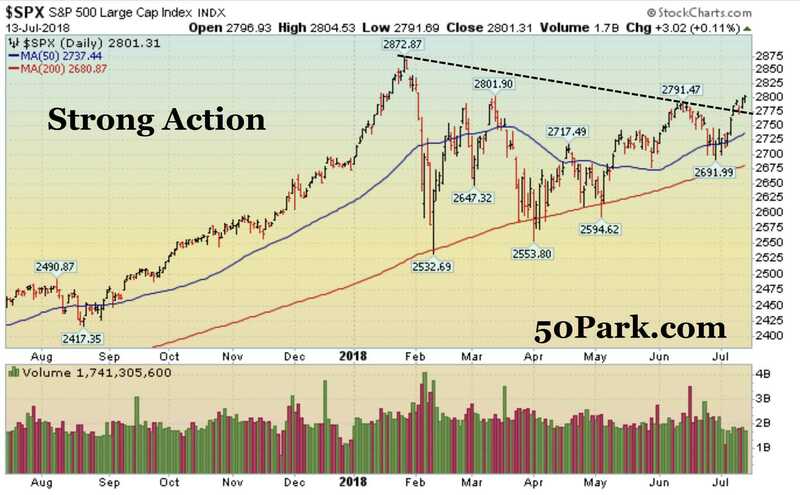 Stocks rallied nicely on Wednesday helping the benchmark S&P 500 breakout of its recent handle pattern. 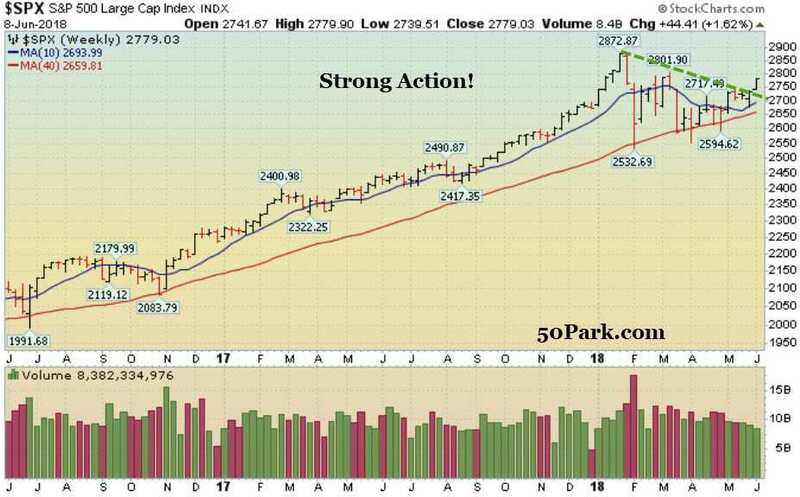 The action remains healthy as other areas of the market that had been under pressure perked up: financials, housing, biotech and healthcare, just to name a few. Stocks were mixed on Thursday as the Dow led while the Nasdaq, S&P 500 and small-cap Russell 2000 ended lower. Separately, Warren Buffett and Jamie Dimon publicly said companies should stop reporting quarterly guidance because it is “too short term” and hurts long-term investors. Stocks were relatively quiet on Friday ahead of the G-7 meeting. Once again, the market had every chance in the world to fall last week and the fact that it didn’t is very bullish. Even though it was a shortened holiday week it was a busy week of headlines nonetheless. The market opened on Tuesday with a big decline after the political turmoil in Italy was announced. Then stocks rebounded nicely on Wed, fell on Thurs and rallied nicely on Friday after the jobs report was announced. The Dow Jones Industrial Average ended slightly lower last week but near its highs for the week which is bullish sign. The small-cap Russell 2000 continues to lead its peers followed by the tech-heavy Nasdaq composite. For now, the action remains very healthy across the board and near-term support remains the 50 DMA line. As long as that level is defended, odds favor higher prices will follow. To be clear, the bulls remain in clear control until any serious selling shows up. Stocks were closed on Monday in observance of Memorial Day. Stocks fell nearly 500 points on Tuesday after fear spread regarding the political situation in Italy. Over the long weekend, news spread that two political parties in Italy may not be able to build a coalition which sent the euro -and global stock markets- sharply lower. If Italy can’t reach a deal the country will be forced into another shotgun election and the new party could vote to leave the EU. Stocks rebounded sharply on Wednesday after the Italian two-year bond yields fell to 1.72 percent from 2.1 percent, which erased much of Tuesday’s climb. Separately, the small-cap Russell 2000 hit a fresh record high. On Thursday, stocks fell hard after President Donald Trump issued tariffs on the European Union, Mexico and Canada, sparking fears the U.S. could enter a trade war with some key allies. Once again, the selling was short-lived because stocks bounced back sharply on Friday and closed mostly higher for the week. Before Friday’s open, stocks rallied after Trump tweeted that he is looking forward to the jobs report -before the report was released. Typically, the President is breifed on the number the night before so stock futures rallied sharply after the tweet. Indeed, the report positive as U.S. employers added 223,000 new jobs last month and the unemployment rate fell to 3.8%, both readings beating estimates.